When you say "no message comes up" did you try pressing the SET button 5X and see if a fault code comes up? Check these 2 fuses below - the fuses are inside the connectors - when you unclip the plugs you will see the fuses inside of the plugs. Both of mine were badly corroded. Cleaned/replaced them & started right up! Now have 14.5V across battery posts - system is charging fine now. ... took me 2 days to figure it out tho! 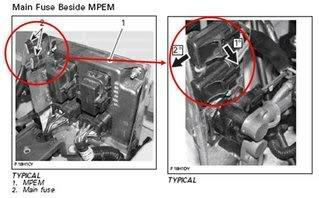 Where did you get the pictures of the 2 fuses? The pictures are still a little hard to see. 12 volt low warning, where is rectifier?